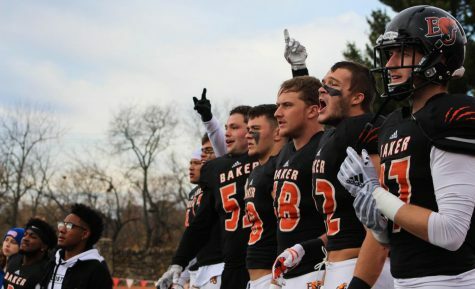 The Baker University football team’s streak of late-game heroics came to an end on Saturday, as the No. 8 Wildcats fell to No. 14 Benedictine College 42-28. The Wildcats’ offense was running on all cylinders, with senior quarterback Jake Morse throwing for 311 yards and three touchdowns. The team also added 233 rushing yards. The struggle came on the defensive side of the ball, with Baker allowing a season-high 685 yards of total offense from the Ravens. Benedictine’s quarterback Bill Noonan passed for a school record of 457 yards. 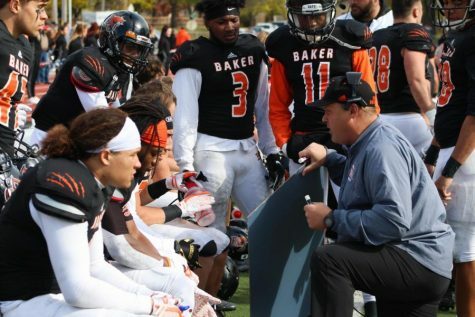 Running back Cameron Fore also gashed the Baker defense for 171 rushing yards, including a 71-yard touchdown late in the fourth quarter. 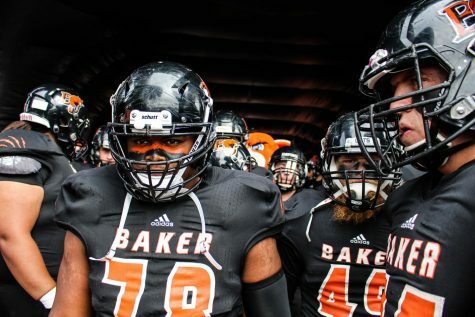 Baker once again started the game from behind after a slow start, falling to a 17-7 deficit by the middle of the second quarter. However, the Wildcats managed to bring the game to within three points on a 2-yard touchdown run by sophomore Alex Stebbins. Benedictine’s offense responded quickly to nearly every Baker score, including the run by Stebbins in the end of the first half, as the Ravens drove 44 yards in the final 48 seconds of the quarter, capped by a 33-yard field goal as time expired to give Benedictine a 20-14 lead. The Wildcats’ defense looked like it had made strong halftime adjustments, shutting down Benedictine in the third quarter. Baker took a 21-20 lead with 3:27 left in the third after a 12-yard reception by senior Tyler Hatcher. Hatcher led the Wildcats in receptions with seven and was second in yards with 82. 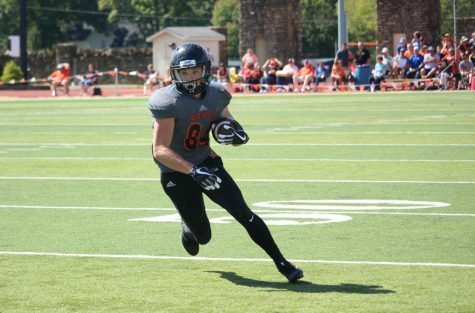 Sophomore Dylan Perry finished with 85 receiving yards, including a 56-yard touchdown. 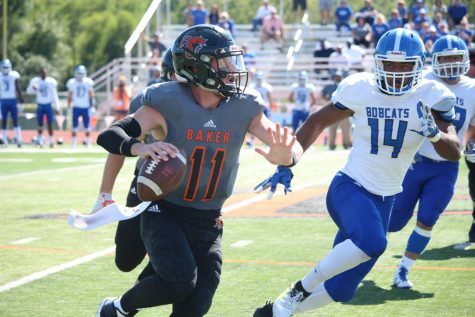 Baker then extended the lead to eight on the opening drive of the fourth quarter on an 18-yard connection between Morse and junior Camren Tornaden. From that point on, Benedictine took control of the game. 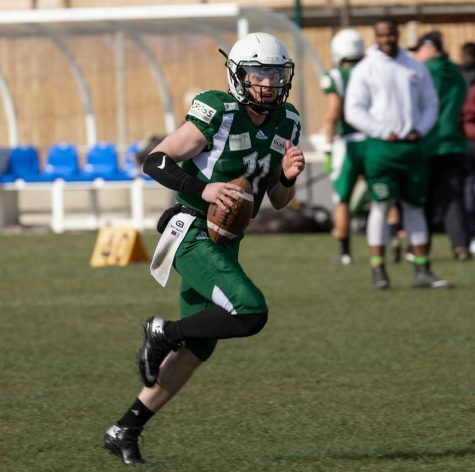 Just 1:22 after the Tornaden touchdown, Noonan drove the Ravens 70 yards down the field in three plays, with a 5-yard touchdown pass to wide receiver Jerrin Walton to close the gap. Then, the subsequent two-point conversion tied the game at 28-28. Following a Baker three-and-out, the Ravens marched toward the end zone and regained the lead on a Noonan pass. 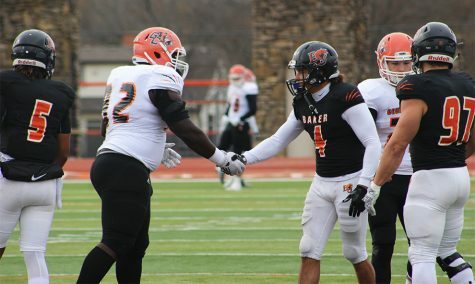 Down 35-28, Baker was given a golden opportunity as the game wound down, recovering a Benedictine fumble at midfield. The Wildcats moved to the Benedictine 33-yard line, before Morse was picked off in the end zone by Ely Hendricks. As the clock ticked away, the Wildcats had one last Benedictine third down to stop before getting the ball back with less than two minutes remaining. But Fore burst through the line for a 71-yard score, sealing the game for the Ravens. The loss drops the Wildcats’ record to 2-1. 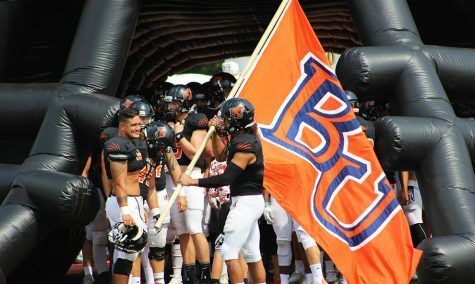 They will look to bounce back Saturday as they host Avila University at 6 p.m. at Liston Stadium.